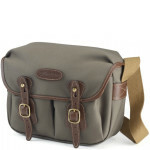 The Hadley Small is a compact camera bag with customisable features and strong, waterproof design. With traditional British styling, this smart yet sturdy shoulder bag is a reliable companion for outdoor-loving photographers. Accommodating a SLR and up to two lenses, the removable camera insert allows you to convert with ease for personal use, with spacious front pockets for accessories. Available in FibreNyte or canvas with leather trimmings, it’s a handsome bag for men. Built for endurance, choose from Stormblocker canvas or FibreNytre; both are waterproof, strong and supple with side weather flaps to further protect your equipment. 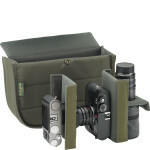 Cushioned for protection, the removable camera basket has four Superflex partition dividers. Fill with your gear or remove for everyday use. One of the more compact bags available from Billingham, this bag weighs just 700g and has a slim, flexible design that comfortably moulds to the contents. Two gusseted pockets on the front offer additional storage for accessories and small personal items. The large cover flap closes securely with dual quick release clasps, with adjustable buckles to holds the contents firm on the move. The Hadley Small balances strength, style and flexibility to offer photographers a versatile camera bag that isn’t limited in usage. Staying faithful to classic British design and craftsmanship, it’s a premium choice for men always on the move. 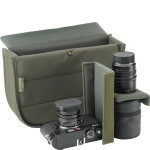 Securely carry your SLR and two lenses, or lens and flash, in the high-density closed-cell foam padded interior. 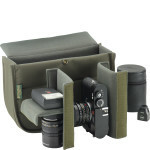 The removable basket includes two large and two small Superflex dividers, which can be arranged to hold your gear. A weather flap protects the contents, whilst the Stormblocker canvas is fully waterproof. 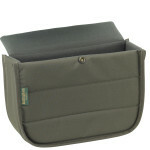 On the front, expandable gusseted pockets provide storage for accessories and personal items. The solid brass clog bolt and harness leather locking system keeps contents secure on the move, complemented by quick release clasps for convenient access. With an adjustable shoulder strap and compact, supple design, it’s a comfortable and durable bag for daily wear. Made from dual laminate Stormblocker canvas or resilient FibreNyte, this bag may be small but it boasts heavy-duty design. Soft and flexible, the exterior is complemented by genuine tan leather trims and brassware, with quality construction throughout. Use a clean, damp cloth or soft bristled brush to clean the bag, and apply a leather treatment to the trimmings. Protected by a 5-year warranty, the Hadley Small is designed to face the challenges of daily life. 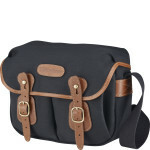 Billingham has been a leading provider of camera bags for over 40 years, with an extensive range of bags that bring classic designs up to date for modern-day photographers. 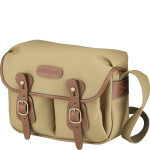 Designed and made in Britain, their collection of camera bags are renowned worldwide for their high quality. Solid brass clog bolt and harness leather locking system.